Discover a world where commonplace observation and insight collide. 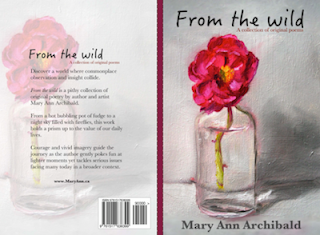 From The Wild is a pithy collection of original poetry by author and artist Mary Ann Archibald. From a hot bubbling pot of fudge to a night sky filled with fireflies, this work holds a prism up to the value of our daily lives. Courage and vivid imagery guide the journey as the author gently pokes fun at lighter moments yet tackles serious issues facing many today in a broader context. ISBN INFORMATION FOR BOOKSELLERS AND LIBRARIES IN THE DETAILS BELOW. From The Wild is available to you in print and online from many bookstores and libraries. If you are in a bookstore or library and cannot find a copy, please provide your retailer or librarian with the ISBN numbers (below) of the edition you would like to buy or borrow. Simply provide your librarian with the ISBN for the print edition of your choice (trade or paperback). Library websites often have purchase request pages if it isn’t already in their holdings so you may have to provide your library with information so they can purchase a copy for you (and others) to borrow. The ISBNs for all editions of From The Wild are listed above for your convenience. ISBN stands for International Standard Book Number, it is part of the language librarians speak. A gorgeous collection of thought and memory provoking pieces. "They're very down to earth and based on the poets more 'every day experiences'. You get a sense of the type of person she is by reading them. I won't say that they're the best I've ever read but they are well executed and I enjoyed reading them. There's a good evocation from the use of imagery and sentiment. They're worth adding to your kindle." "Some of the best poetry I have read. 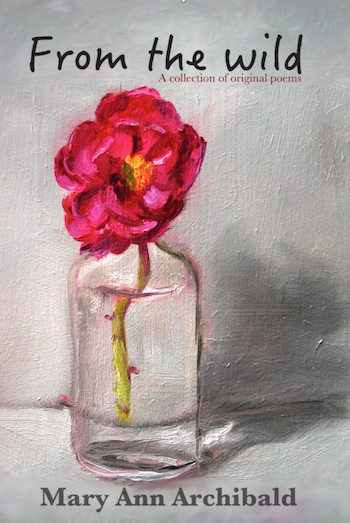 It seems, in my mind, that these poems collect the pieces of emotions she felt about the subject enabling the reader to instantly smell, feel, and almost touch her thoughts." "A quick and enjoyable read!" "Far under-priced, these poems are evocative of warm personal moments and elements of life worth the silence and attention to appreciate. Appreciation is the feeling one is left with after a visit to this world of Mary Ann's. And, for those without one; of home." "Your words awaken the senses and made this reader feel very alive. It was almost as though I was in the moment with you." "Wonderful work Mary Ann. Some of those images really stick with you." "I was touched by your poem Fudge. It evoked memories and smells of my mom who passed away last year. I usually don't "get" poetry but the last two lines are most moving." "From a male perspective I thought that you had captured teenage and young men very well. I thought that this is a multidimensional woman." From The Wild was originally published as Poems: twenty-cents-each. I published it as a "living book," meaning when I added new content, I updated the book and those people who bought early editions (only available digitally) had their copies updated. It was a fun way to approach this project. Those of you who purchased your copy through an authorized ebook distributor will automatically be upgraded to From the Wild the expanded edition, representing the conclusion of this project. Thank you for your support. The image on the left is the original cover, featuring "Amy" an original painting I painted in 2004.